8x10 print of "Hall of Records", printed on quality, semi-gloss Archival paper. 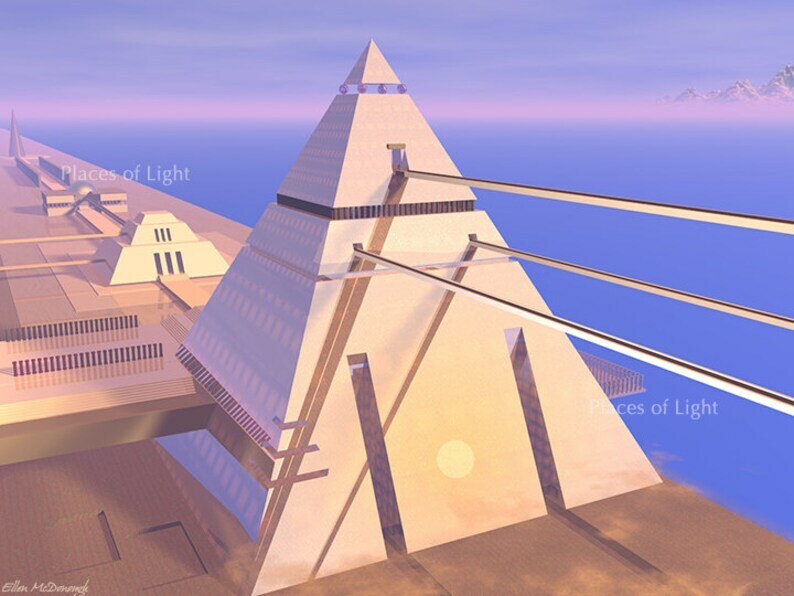 Mystical, sci-fi image featuring a pyramid plaza containing all secrets of the Universe. Bestseller! BESTSELLING ITEM - especially among men! Hall of Records is a huge pyramid containing all the secrets of the Universe since the beginning of time. Access to the enormous structure is only through concourses stretching high above the ground, and access is granted only to the most advanced souls. The setting sun is reflected on the pyramid's shiny surface. Some of the esoteric records within the immense walls of the pyramid are written, but most are encoded in crystals. Only the wisest can decode the secret writing, and only they may access the knowledge imprinted within the crystals. Al long line of structures extends directly behind the pyramid, storing even more ancient records. The plaza runs along a vast body of water, adding to the expansiveness of the scene.